You may have heard me talk (a lot) about the gut microbiome. It’s something that I have researched extensively over the past few years after I found myself in a bit of a tricky situation health-wise. I decided that I needed to treat my health, body and mind from the inside. I read a great deal about leaky gut syndrome, how to re-populate the gut and which foods/supplements were best for doing so. Friendly gut bacteria go mad for High-fibre foods (especially raw), they absolutely love it and they flourish when they get a regular supply. Foods high in sugar and those containing gluten can feed the unfriendly guys which then outnumber the good guys! We don’t want this to happen and that’s where a nutritional supplement can help. So, can you imagine my sheer delight (all my Christmasses came at once), when I made the discovery of the century! 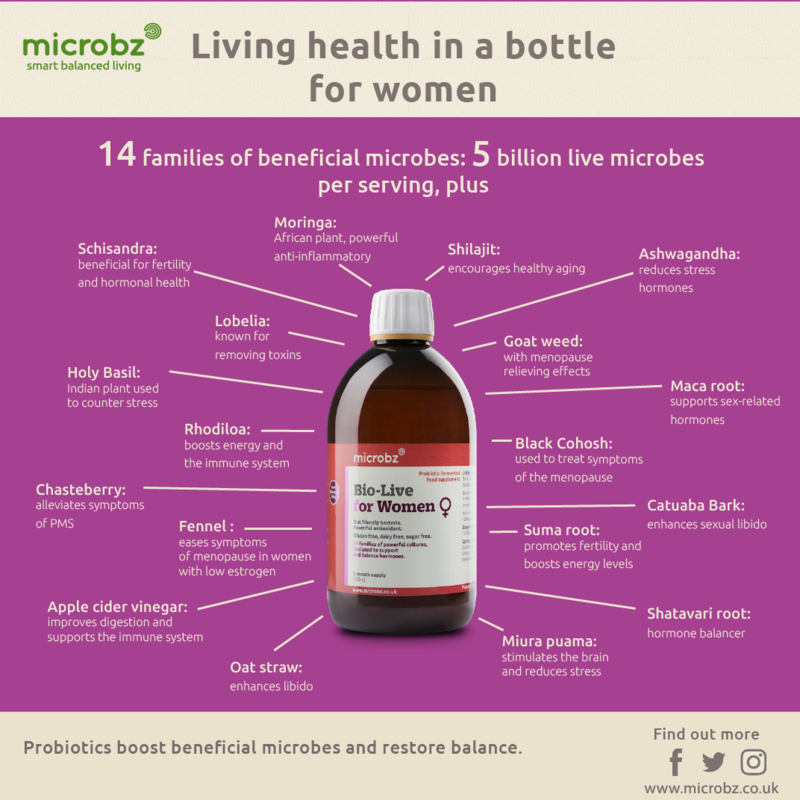 Microbz hand-brew their life-enhancing, transformative probiotic supplements to restore and balance the body and mind. They combine active and beneficial ingredients to create a harmonious environment in which our individual biome can thrive. Each product is brewed by hand with love, care and knowledge and I LOVE the ethos behind the brand; “Probiotics good for you and the planet”. We are one with the environment so when we take care of ourselves and the planet in a conscious way, great things happen! 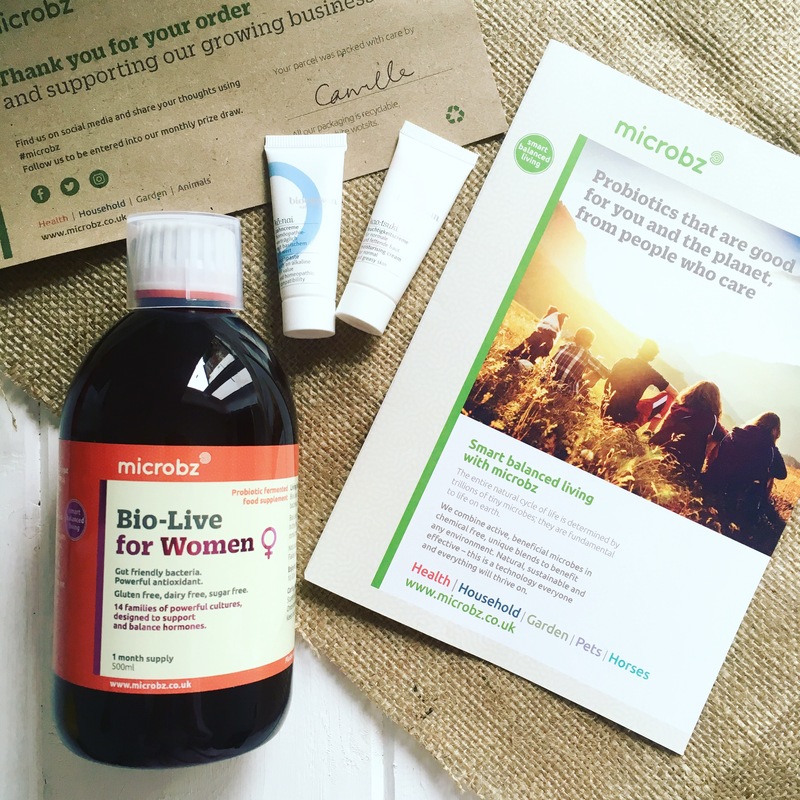 I have been taking the Microbz Bio-Live for women for 3 weeks and the results have been amazing. The 500ml bottle contains a 1-month (daily) supply and bursting with anti-oxidants. It’s also gluten, dairy and sugar free. How amazing is that! It has been specifically designed to support and balance hormones and the 14 families of powerful cultures work their magic in the gut. I keep imagining the good guys in my gut doing a little happy dance when they receive their shot of awesomeness! I can honestly say that my energy levels have increased, I feel brighter and I my mood during peak hormonal activity (bleugh) was much breezier! 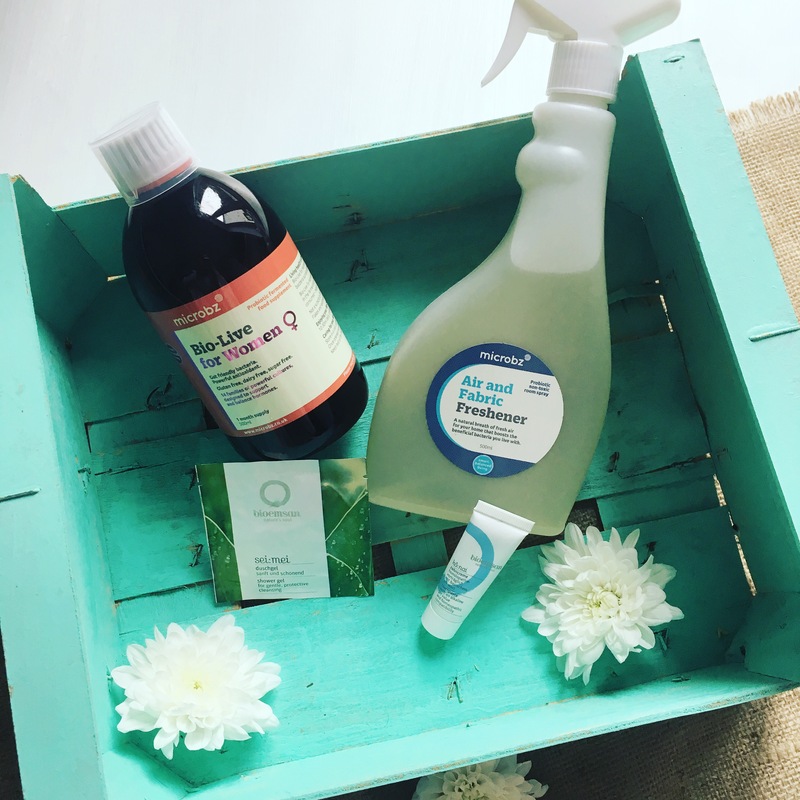 I feel like my core, the foundation is more solid and for me, this is the key to creating and maintaining optimum overall health and wellbeing and as the chiller weather draws ever-closers it’s even more important to nourish our bodies. 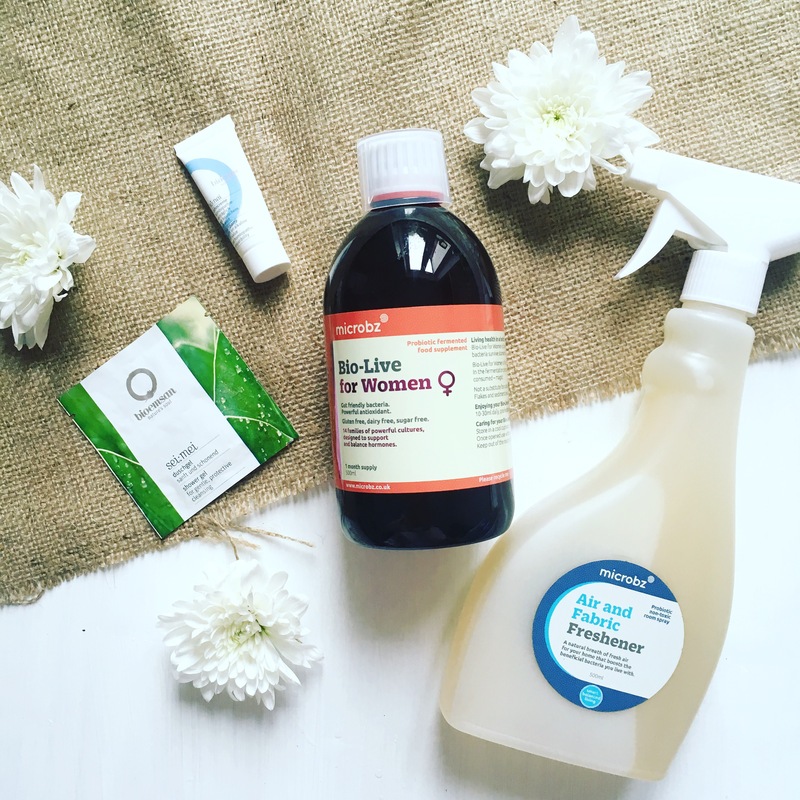 I also have some amazing skincare and household products to try which I will blog about later. I can’t wait to give them a whirl.